Obituary for Gilbert A. Boyden | Arehart-Echols Funeral Home, P.A. Gilbert Allen Boyden, 84, of Bel Alton, MD passed away on February 4, 2019 at Washington Hospital Center in Washington, DC. Gilbert was born in 1934 in Lebanon, OH to the late Ralph L. Boyden and the late Mollie M. (York) Boyden. He is preceded in death by his son, Brian L. Boyden. He is survived by his children, Cynthia A. Coffey, Alan Boyden, Lance Boyden and Wendy Jean Boyden; his grandchildren, Jamie Link, Clyde Coffey, Olivia Hill and Billy Hill; and four great-grandchildren. He is also survived by his siblings, Charles C. Boyden, Sherry Wright and Randy L. Boyden. Gilbert and his family moved to Charles County when he was a child and he attended LaPlata High School. He served in the Korean War for two years and also as an Army Reservist for eight years. 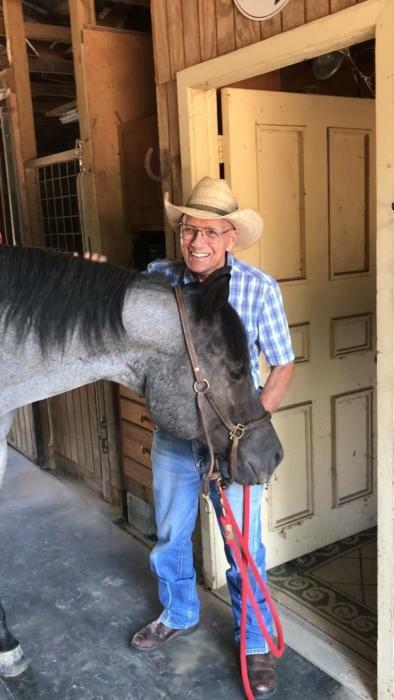 He has been called the “Charles County’s Cowboy”, as he was an avid horseman his entire life. He was a farrier, horse breeder, showed and trained Quarter horses and managed a horse operation in Faulkner, MD. There will be a Gathering of Family and Friends at Arehart-Echols Funeral Home, PA (211 St. Mary’s Ave., LaPlata, MD) on Saturday, February 16, 2019 from 1:00PM to 4:00PM. The Celebration of Life Memorial Service will be from 2:00PM to 2:30PM. In lieu of flowers, donations can be made in Gilbert’s memory to Mounted Wanderers 4-H Club at 3011 Fraser Rd., Bryans Rd., MD 20616. Online condolences to the family can be shared at arehartechols.com.